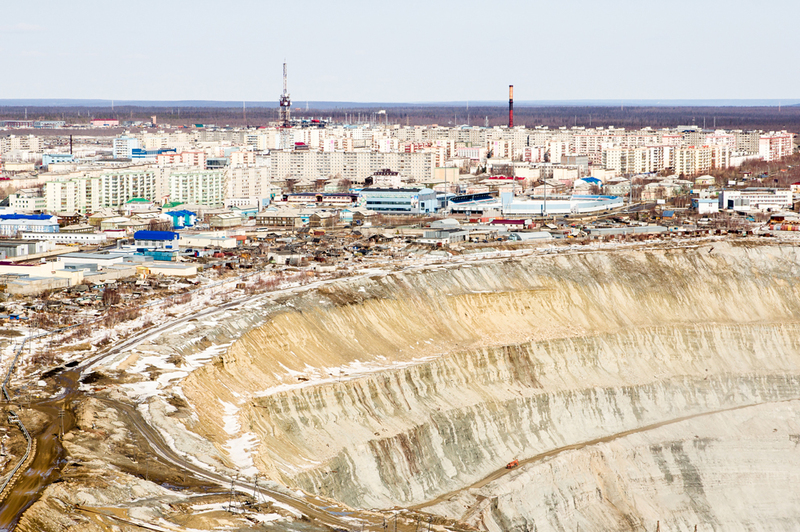 The entire existence of Mirny, Russia, revolves around the enormous pit that is the town's diamond mine. The precious stones attract a steady flow of newcomers looking for work, but the town's residents are divided when it comes to their feelings: While some say Mirny is the best place in the world, others feel trapped in it. The city of Mirny, located in one of Russia’s coldest and most remote regions, exists for one reason and one reason only – diamonds. Indeed, the place owns its very name to the giant pit on the periphery of the town: the Mir (“Peace”) diamond mine, located on one of the world's richest diamond deposits. Mirny (Russian for 'peaceful') was built in the 1950s, growing around a diamond mining operation started by the Soviet government after several rich diamond fields were discovered in the Siberian republic of Yakutia, located above the Arctic Circle some 5,280 miles east of Moscow, with winter temperatures going as low as -94° F.
Mirny is a typical example of what the Russians call a monogorod – a city dominated by a single company. Most of Mirny’s 35,000 residents work in the mine, which now belongs to Alrosa, the world's largest diamond miner. Aytalina (all names changed) was born and raised in Yakutsk, capital of Yakutia. She and her husband moved to Mirny eight years ago after he was offered a senior position in the mining company. The couple have two children. “Mirny is much smaller than Yakutsk, but I would never go back, not for love or money,' says Aytalina, who works as a manager at a store. The family's income is high, so they can afford both shopping and going on regular trips out of town, says Aytalina, and the latter is made even easier as there is an airfield in Mirny. She believes the town's citizens are open-minded and tolerant. “Back in Yakutsk, my husband was often harassed because of his Russian ethnicity; I also got my fair share of accusations for marrying a Russian man, since I'm Yakut. Still, some of Mirny's residents say living here is not at all easy. At first glance, Olga and Khotoy's family seems just like Aytalina's: They moved to Mirny 10 years ago, they have two children, Khotoy works in the mining company, while Olga is a schoolteacher. But that's where the similarities end: Olga and Khotoy are struggling to make ends meet – they live in what amounts to a wooden shed and haven't been able to afford to go anywhere on vacation for several years now. Olga says this inequality is created by the diamond mining company. According to Olga, Mirny lacks skilled personnel other that those involved in the mining industry – there are virtually no good doctors or teachers. This problem could be solved by attracting people from other regions, but Olga says this is not an option at the moment. “Aside from the jobs in the mine, the salaries here are low, especially if you work for the state – I make 19,000 rubles (about $300) a month, and with these prices, this is a pittance. Who would want to come here, then?” she says.